The vast majority of district tournament titles were settled on Friday night. Fortunately, there was still some basketball available Saturday evening. We braved the hellacious traffic that is I-4 westbound from Orlando to Clearwater to take in the Class 4A District 4 Championship at Clearwater Calvary Christian School. 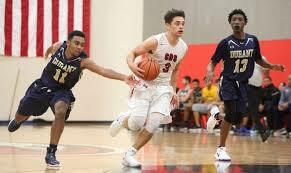 On a neutral court, #1 seed Carrollwood Day School out of Tampa would face neighboring foe Tampa Prep, the #3 seed. The teams met just once earlier in the year with Carrollwood winning by six on their home floor. Things looked good for the Terrapins of Tampa Prep early on. They got up quickly 9-4 with just under five minutes left in the first quarter. From that point on, Carrollwood assumed control of the contest. CDS essentially closed out the period on a 15-0 run as Malcolm Whitlow and Edgar Zieglar took turns knocking down shots from deep to make the score 19-9 after one quarter of play. Truthfully, the second quarter was no better for Tampa Prep as the Terrapins really struggled at the offensive end no matter what combination of players they put on the floor. Meanwhile, Carrollwood kept making shots. At the half, the score was 33-18 but the margin seemed greater than just fifteen points. It didn’t take long for CDS to push its lead past twenty and by the time the final quarter rolled around, A running clock was possible with CDS up 65-37 with four minutes to play. Both teams put their benches in for the last three minutes of action with CDS up 67-39. The Tampa Prep subs were the only group of Terrapins that could find any offense, as they reeled of 9-0 run to make the final score of 67-48 a bit more respectable. Carrollwood was led by Whitlow with 24 points while Ziegler added 20 of his own. Owen Mixon contributed 14 points before fouling out. Tampa Prep had no player reach double figures. They were paced by Jaden Gray with 8 points while both Jeran Phillips and Owen Carlson each had seven points. Once again in these playoffs, a spectator got tossed by the officials. This one happened to be a player’s parent who decided enough was enough when it came to her precious child not getting his due. It was actually the player that had to help get the parent off the court so the game could continue. Not the proudest of moments for either of them I would imagine.